Hello friends. I love visiting different parts of New York City. I was recently there with my niece and we went to Soho. I love going to Soho as there are so many designer boutiques, big chain stores, art galleries, high end restaurants, and nightlife. 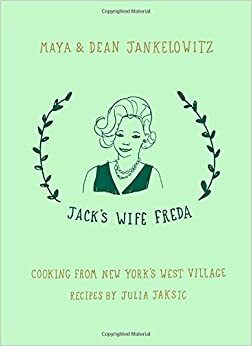 We went there at the end of August and we decided to have lunch at the restaurant Jack's Wife Freda. This popular restaurant was recommended by my teen, who has been there with her friends for lunch. The day we met for lunch, the weather was nice and warm, and I took this photo while waiting for my niece to arrive. It's such a small and cute place to eat and they had some tables set outside. If you do decide to visit this restaurant, it can get really busy, since it's so small inside. You might have to wait outside, but we were lucky as there was no wait for a table. 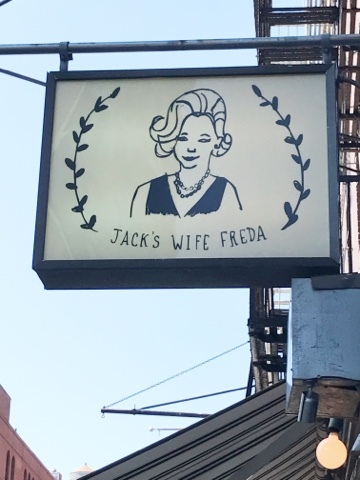 Below is a small map of the location to the restaurant Jack's Wife Freda, located on Lafayette Street, in Soho. The streets are narrow, and some of them are even cobblestone streets, and the area has so many small shops and restaurants. We both decided to sit inside to eat our lunch. 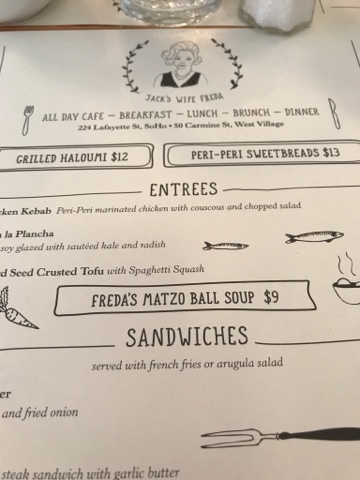 I took a quick photo of the menu. The food is just so good and I love the breakfast and lunch menu. The food is American-Mediterranean and they have a wonderful food selection to choose from. The next time I visit I hope to sample the dinner menu. 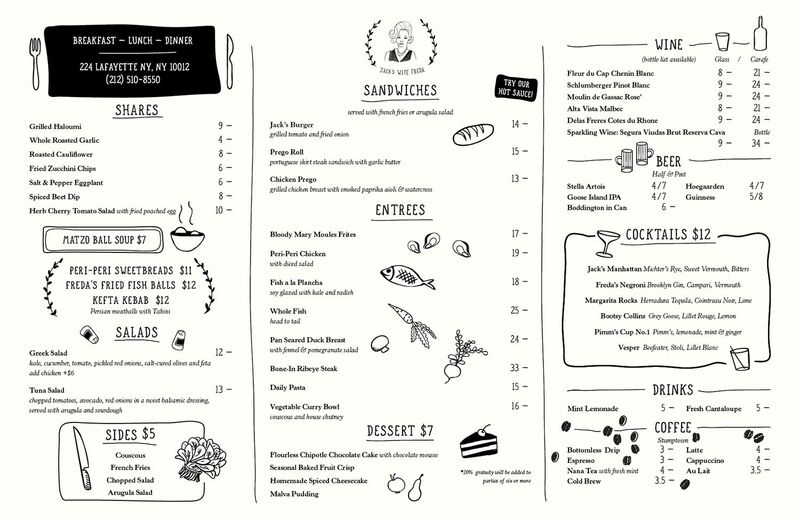 Shown below is a sample of the dinner menu at the Lafayette Street location. The other location of the restaurant is on Carmine Street. I really liked the breakfast (not shown on this menu) and lunch selection of food. The decision was made, we both decide to eat breakfast since it was early afternoon. 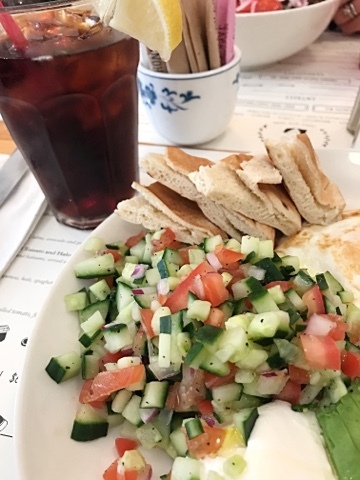 I chose the mediterranean breakfast. 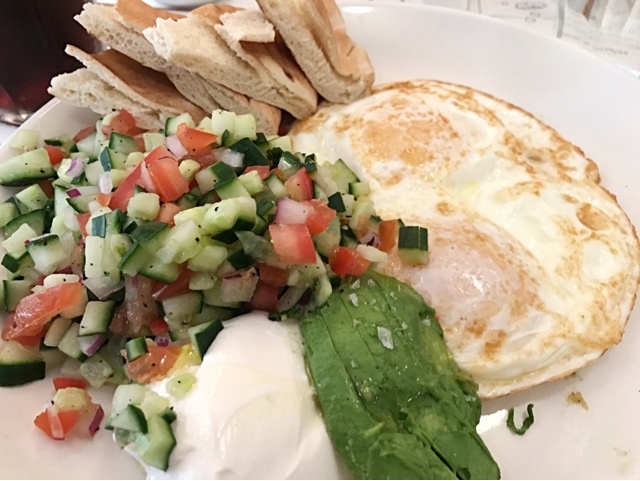 It consisted of two eggs over easy, a chopped salad, with avocado and pita bread. I had fresh ice tea to drink that I really enjoyed. My niece picked the breakfast bowl (sorry no photo of that) and that consisted of eggs, quinoa, kale, spaghetti squash, and avocado and a fresh watermelon drink. The restaurant even has a cookbook that you can buy and make some of their delicious recipes! Have you been to the restaurant Jack's Wife Freda yet? I'd love to know. If you have visited any other restaurants in New York City that you like, please let know in the comments section. Thanks for the visit today. Enjoy the rest of the week and weekend. Jess and I will see you all back here on Monday for our Cooking and Crafting with J & J Link Up. I LOVE that part of NYC. It has been many years since I visited there. I went to school in NYC and loved it- but would not want to live there. I don't know that restaurant at all but I think I would love it. This place sounds so good! I love going to Soho too! Sounds like a fun place! I wish I could go to NYC for a visit! I have never been to that area only down to Tavern on the Green and we stayed at the Hyatt Regency Grand Central. Another time we went to see all the Christmas decorations - really beautiful. Restaurant sounds very interesting and so glad that the food was good. OH I LOVE New York City, I will mention this restaurant to me friend who I visit on Long Island, we were going to SOHO my next visit. The last restaurant we went to was The Rainbow room and it was very expensive and I loved being on the 65th floor of the building NBC? forgot name of building. We also ate at a restaurant on Park Ave once before we were going to the Metropolitan Museum. I won't be back for 2 years because of her busy schedule. Sounds wonderful and my king of place! We visited Soho on one of our trips to NYC but I remember being so overwhelmed by all the shops and restaurants that we didn't go into any of them! We just walked the streets. This will be on my places to go list for our next trip! What a great and fun place to visit and have lunch. Love places like this. I hope to make it to NYC someday soon. This is a new restaurant to me. 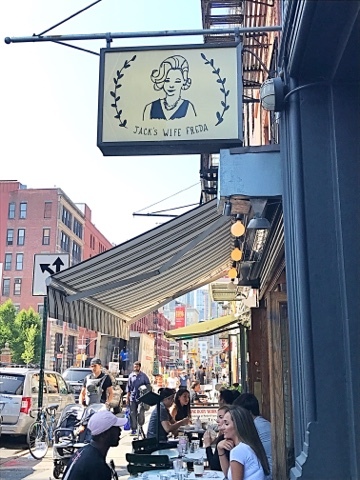 I live in New York and go downtown often and will definitely add this to my list of places to try. Great post! Love the map. I love the sign. It is so classic and retro. What a fun outing. Wow...that food looks amazing! I am putting this one on my list...thanks, Julie! Breakfast is always our food of choice anytime before 2. It's not always easy to find a place that serves breakfast all day but you managed to find a really cool one! What a great place. It is always nice to share good restaurants we find. In fact, I am going to NY next week. Thank you Julie for sharing at DI&DI. What a unique and fascinating restaurant! And oh, the food looks amazing. I love hearing about new restaurants to try, and this is going on my list to try next time I'm in SoHo. It looks like the perfect combination of great food and ambiance. Thanks for the tip!